Hopefully by now you are familiar with MOGA and all that it can unlock for Android gamers (and soon for iOS gamers). If not, MOGA enables mobile gamers to turn their smartphone into a portable gaming machine. Simply slide your phone into the smart grip and connect via Bluetooth to enjoy an almost seamless gaming experience. At PAX Prime we stopped by the MOGA booth after hearing crazy “MOGA!! MOGA!! MOGA!! MOGA! !” chants from across the venue. Sure enough it turned out to be worth our time. Below is the first of many HTG product reviews and hopefully many more MOGA products! 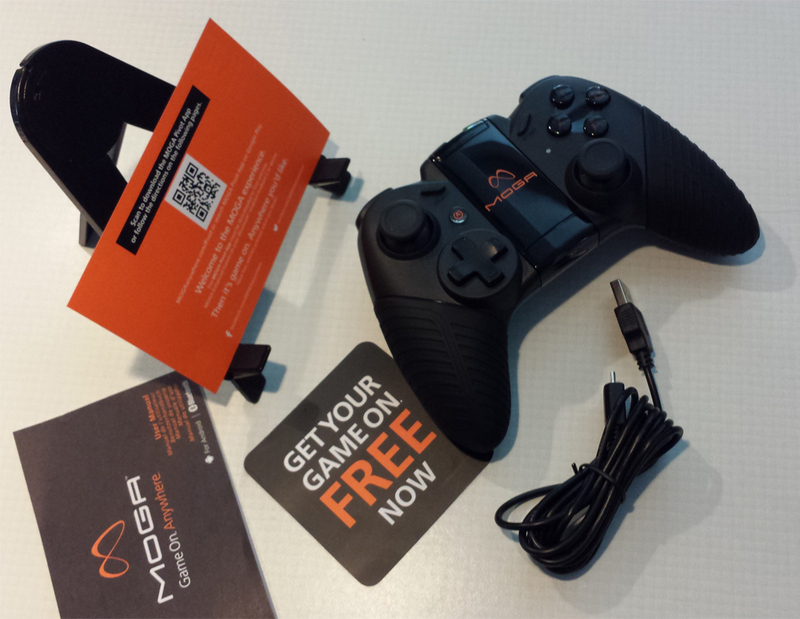 The MOGA Pro model is currently the most advanced mobile gaming product they offer. The box contains 1 controller that should look pretty familiar to any gamer, especially to Xbox 360 users. Also included is 1 USB cable for easy charging on any USB driven device, 1 tripod like stand for your phone or tablet , device manual and a couple codes for some MOGA enhanced games from the Google Play store (Ours came with Pac Man and Nova 3). There is also a quick QR code you can scan that will also take you right to the free MOGA Pivot app that is used to filter MOGA enhanced games with ease, or you can also find it by searching the Play Store. All in all, minimal set up and easy to figure out, even for a new smartphone user. 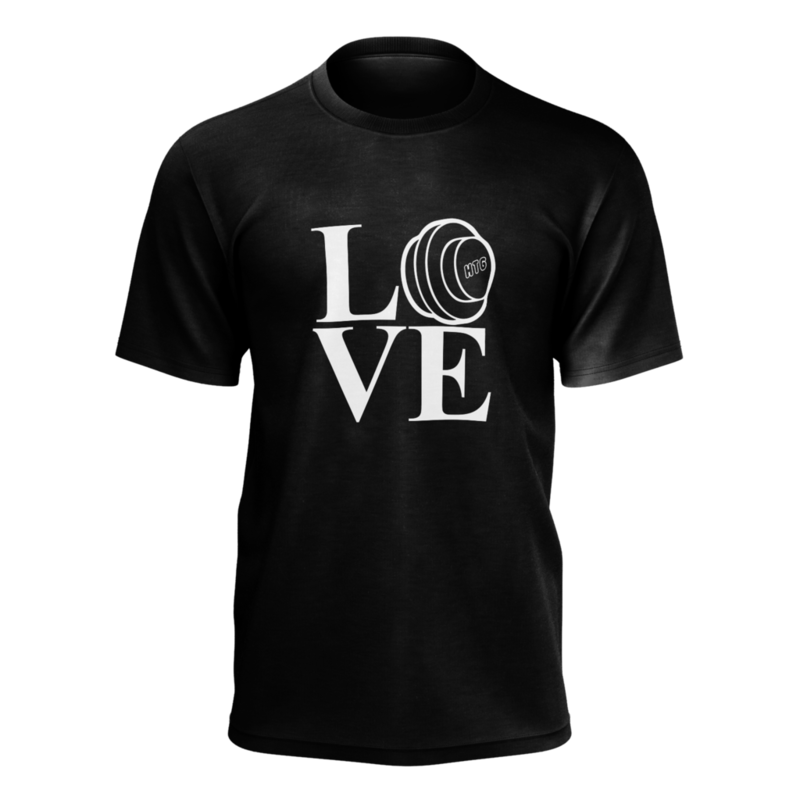 Without a doubt the design has had lots of research and development over the last few years. This was one of the benefits of closely designing the MOGA Pro after one of the most held controllers in the world to date. The fact that even users who knew nothing about the MOGA would for sure instantly connect with the design was a huge plus for the first impressions. Connecting to your device is as simple as Bluetooth pairing your phone or tablet with the MOGA Pro and with your mobile device (we used Samsung Galaxy S4). A flashing blue light indicates that your MOGA Pro Controller is pairing with the Bluetooth enabled device. Then usually it still requires a few on screen touches to navigate to games, but once the game loads the controller takes over and immediately increases the enjoyment level of whatever game your playing. In some cases if you have the right phone/tablet and right TV you can even play your Android games with the MOGA on your TV! One thing you can’t see from the pictures, is there is a button that actually illuminates the buttons for viewing in the dark as well. Its clear that MOGA wants the controller to win over anyone who touches it, regardless of experience with games and not feel left out. The addition of adding the mobile device stand is a no brainer too. The MOGA Arm can hold a device that is up to 3.2 in. / 82mm in width. In the rare occasion your tablet might be too large for the smart clamp, the stand provided proves to be an excellent alternative. At one point while testing ours too, we used the stand and hooked our phone up to some mobile gaming speakers which made it easier dealing with the cords to our speakers. So there are more then a couple options of how you play your games once you add MOGA to the party! Its worth mentioning too, there is an app that comes free with the MOGA Pro or you can search it from Google Play Store called MOGA Pivot. Pivot allows you to search through the library of MOGA Enhanced games. Currently there are roughly 50+ games ready for your MOGA controller and each month new developers are joining in to add to the possibilities with their current and future games. Currently you can find Grand Theft Auto: Vice City, Sonic CD, Jet Set Radio, Modern Combat 4: Zero Hour, Tiki Kart 3D, The Dark Knight Rises HD, N.O.V.A. 3, Pac Man and NFL Pro 2013 just to name a few. So right out the box, the possibilities are pretty good, and knowing there are more on the way makes this an even better buy than it already is at $49.99. As mentioned already, the controller is based off of what a lot people define as “the controller of its time.” That being said, it does sort of just fit right in your hand. The grips, in my opinion, are slightly improved over the 360 controller by adding the slightly grooved rubber grips. Comparing weights of the 360 and MOGA PRO, MOGA feels lighter. 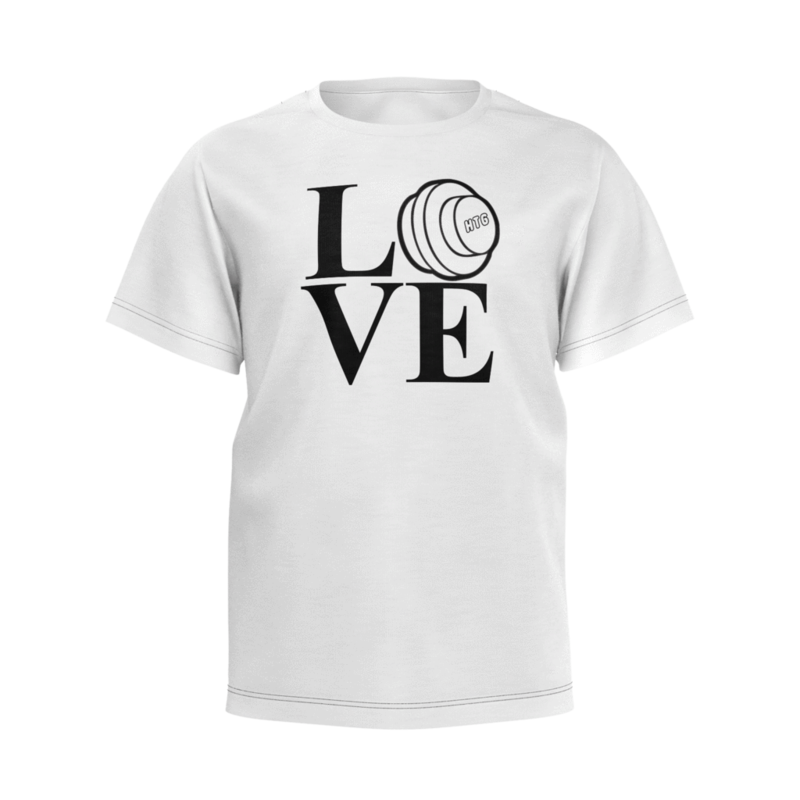 Once you add your mobile device to it, there is a noticeable weight difference. Being a PlayStation dominant player, I can still say this controller feels and acts like you would want it to. 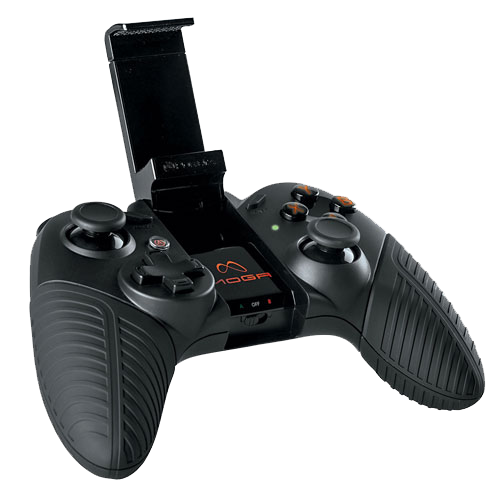 That, I think, will appeal to a lot of gamers out there who are not even giving the MOGA a try due to its design. So if you’re listening MOGA, it might be a smart move to consider a PlayStation-esk version as well. 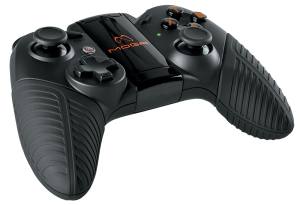 The overall feel of the MOGA Pro is pretty solid though, even for long gaming sessions. Although our library of MOGA enhanced games that we tested isn’t very large, we picked some of the more advanced games and along with the MOGA Pro, they blew our minds! Its the closest thing to console gaming on the go we have experienced so far. 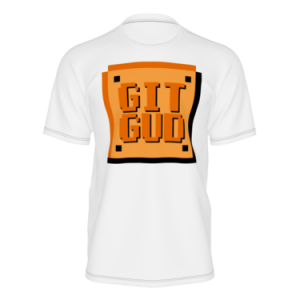 So as we all know, you need a good game AND good controls to truly enjoy the experience. The MOGA Pro delivers for sure in this department. Its got a sturdy build that feels solid but is surprisingly light and the buttons are extremely responsive for instant action on screen. The buttons also light up with the touch of a button too, in the event you want or need to see what buttons you’re mashing. Once we paired our device (Samsung Galaxy S4 was tested), turned on the MOGA and we were off and running. We tested a free game from the Google Play Store called “Dead Trigger” which we found using the free app that came with the MOGA Pro called MOGA Pivot. Its an FPS Zombie shooter that is extremely fast paced and really helps the MOGA shine or maybe its vice versa. Lets face it, using touch screen controls works for some games, but this is not really one of them. As a stand alone game I most likely would not play it very much, but MOGA instantly transforms Dead Trigger into a exciting game that I have been playing frequently. There seems to be no delay whatsoever on the controls regardless if we use the smart clamp, or the stand to hold our device. The other game we tested was a $.99 intense racing game called Asphalt 8. As soon as you launch the game from your home screen (or the MOGA Pivot app) the Pro takes over and you are in full control. Again we found the response time of the device to be spot on allowing us to drift through tight corners and fill our nitro tanks by smashing everything in site with precision. After a few races we removed our phone from the smart clamp and tried to race without controller. Navigating the menus was simple and easy, but the second we started the race we were having troubles steering and as responsive as our touchscreen was, it still seemed to be less accurate then when using the MOGA controller. For me these games went from mildly playable to amazing and entertaining simply by adding MOGA Pro. Currently the MOGA does not run your home screen or allow you to browse your contacts or calendar events on your mobile device. We understand that this is targeted as a gaming device, but having full control of your mobile device while using the controller would be an amazing feature to add. The only other thing we ran into was that we got so into playing these games, that our time was often cut short due to our phone’s battery life. Using the phone to run the game and to connect via Bluetooth surely uses some battery life. Rumors are there is a new model on the way to solve that issue though and hopefully we will know more on that shortly. The couple of weeks with this fun little addition has proved to be worth its weight in gold, and to think there is a better, more efficient model coming is almost unbelievable. We have talked a bit about the battery life of mobile devices but I want to talk about the built in rechargeable battery to the MOGA Pro and its life span. So far we have seen roughly 3-4 hours of gameplay and a handful of standby hours as well before we needed to put it back on the charger. To charge you simply plug in the provided USB cable and it took us about 30 min to charge it fully. 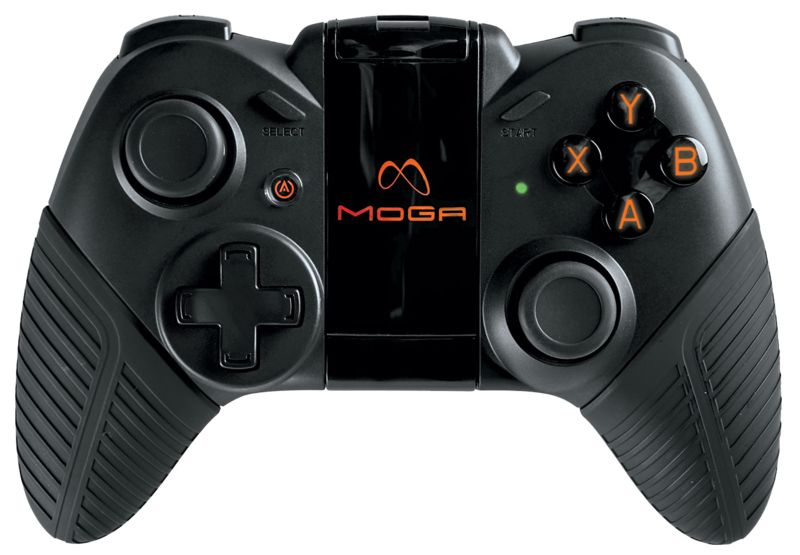 One cool feature that is built in is, the MOGA Pro Controller will go to sleep after seven minutes of inactivity. In the event your controller goes to sleep, hold down on the Power A button on the controller for three seconds. It will begin flashing blue again and automatically pair to your mobile device again within 20 seconds, which is nice. So as it sits, depending on settings and what mobile device you use, the MOGA Pro should outlast your phone’s battery. The simple fact is, MOGA makes mobile gaming awesome. The fact that I am revisiting old games with terrible touch screen controls and I am eager to check out new titles proves, at least to me, that this device is a success. Knowing too, the only real issue we had with the device, which was the phone battery lifespan being short, will be solved with the newest model shows this device will continue to evolve ’till it’s right and offers different models for different types of users/gamers. After 5 minutes of demo time, we knew we had a hit in our hands and were happy to bring it here to share it with you guys. Personally I would almost wait for the MOGA PRO Power series to drop here soon. I only say this because you will be attached to your charge cables for both the MOGA and your mobile device until then. Its recommended that you continue to watch their website MogaAnywhere.com and their Facebook page as well to keep up on new models, keep up on the latest MOGA Enhanced games, or to give your suggestions or feedback. After talking with the MOGA Rep at PAX last month, it was clear that the users voice has and will continue to be heard. So many companies forget how important crowd feedback can be, but there is clearly a crowd presence showing through in the couple of designs shown so far, and from what we expect to roll out next. 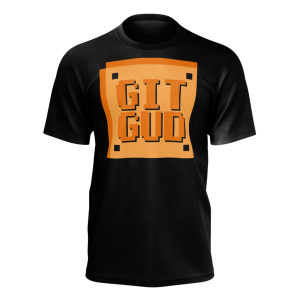 If you are a gamer (which if you are not how did you end up here reading this?) and you leave your basement once in a while, you most certainly owe it to yourself to check one of these out. I don’t care if your friend has one and you use it, or you call me to bug me to come try mine, you need to experience this. 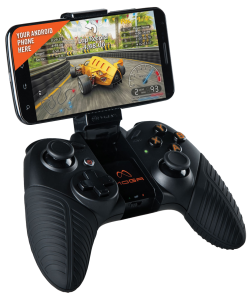 There are a couple of other devices on the market that might compare to the MOGA, but if your looking for an alternative to buying yet another portable gaming device consider either the MOGA Pocket or the MOGA Pro for your traveling gaming needs. 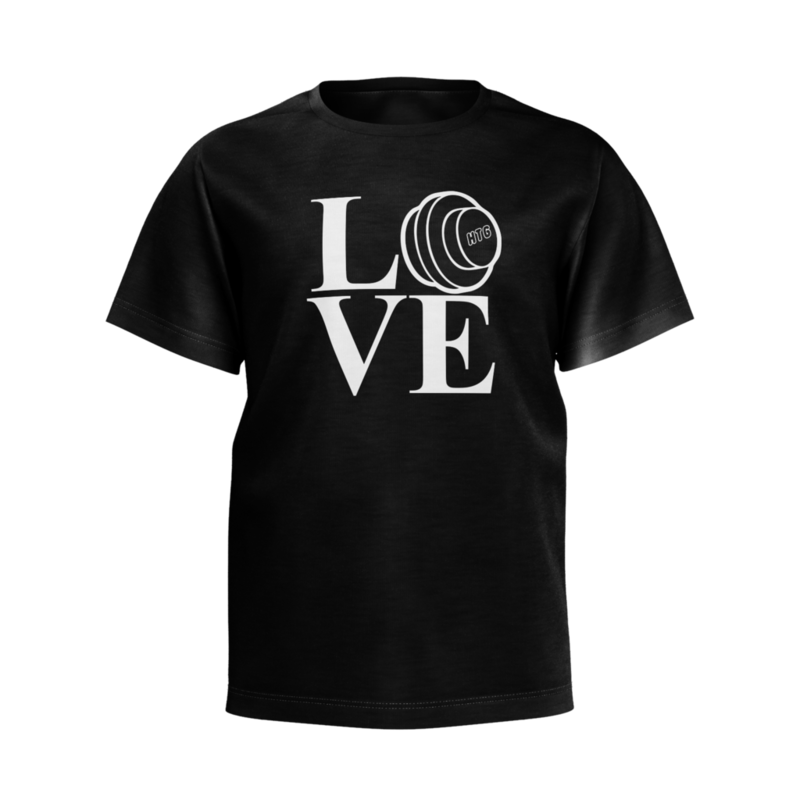 We will, for sure, never leave home for any length of time without ours now! 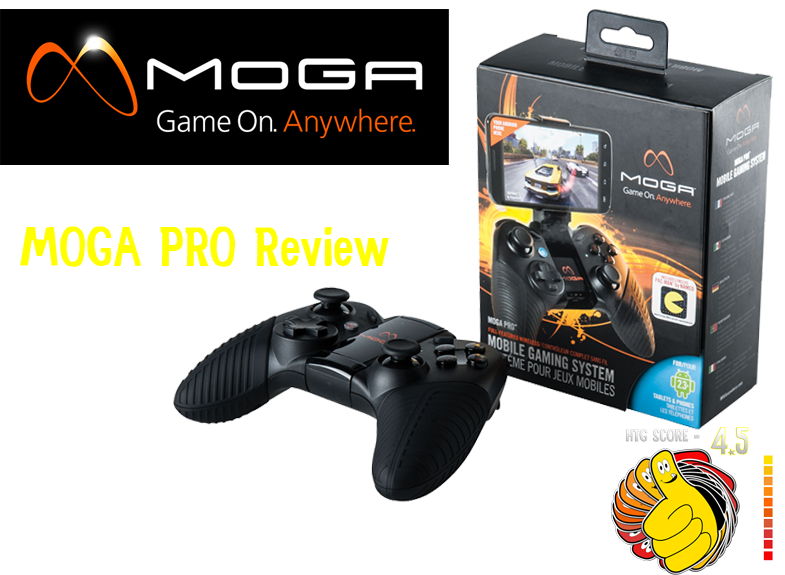 MOGA PRO Power coming soon shown below! Our total score for the MOGA Pro is a 4.5 because it shined in all areas. The battery issue was really the only major downside to the controller, and we already know they are fixing this issue with a new improved MOGA Power Series coming soon. If we were to get some more face time with the research and development team at MOGA, we would also suggest to create the PlayStation style controller and possibly even a Nintendo based version as well to cater to all gamers out there. The addition of device operating system control would be the icing on the cake as well. Its totally not needed, but just think, if you could check emails and browse through webpages the possibilities of a keyboard accessory also becomes a possibility. Sure it would eliminate some of the portability but if done right, MOGA could turn your mobile device into a full on mini computer that gamers would feel right at home with on ALL levels. We want to thank Steve and Justin who showed HTG some love at the MOGA Booth during PAX Prime 2013 and we hope this is just the beginning of a long beneficial friendship!